If you’d like to ask us anything, request a tender or send us a message, please feel free to contact us. Our reception is open 08.30 - 16.30 and closed for lunch between 11.30 - 12.30. The trams stop at Chalmers (in front of Chalmers-platsen), and from there you can walk to SSPA (for more information look at the map). Total time 40 minutes. We recommend Expresstaxi, telephone: + 46 31 - 81 10 19. The tram stops at Chalmers (in front of Chalmers-platsen), and from there you can walk to SSPA (for more information look at the map). If you want to know the exact time of departure for buses and trams, please visit the website for Västtrafik. From the E6/E20 and road 40 - exit at Örgrytemotet and follow the signs for Svenska mässan and Liseberg. When you reach the roundabout Korsvägen (tram and bus stop) follow the signs for Guldheden and Eklandagatan. Turn right when you reach Gibraltargatan and continue for about 0.5 km until you reach Chalmers Tvärgata. 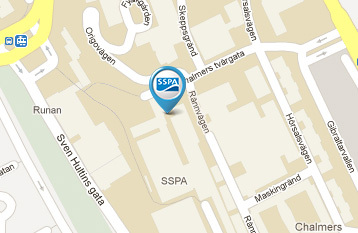 SSPA is situated at the end of the street. Our address is Chalmers Tvärgata 10.